Every Day in one of the busiest cities of the world, an army of men start their daily work; nothing unusual there but these men are unique. For over 125 years, they have provided a service to the people of Bombay, now Mumbai, that is the envy of the world. They are the Dabbawalas, the tiffin carriers who have a system of delivery that is unsurpassed and with it they ensure that the workers of Mumbai receive their home cooked food in perfect condition and on time every day. The system is almost faultless and such is the wonder of these men that International companies seek them out to better understand their process and how they achieve what they do. Mumbai (previously Bombay until 1995) is situated on a peninsula of land on the west coast of India, surrounded by the Indian Ocean. It is the capital of the state of Maharashtra and is the largest city in India. Initially, Mumbai was the accumulation of seven islands which with the passage of time joined to form island city of Bombay. For centuries, the islands were under the control of various peoples before being passed to the Portuguese Empire and subsequently to the East India Company. In 1661 Charles II of England married Catherine of Braganza and as part of her dowry Charles II received the ports of Tangier and Seven Islands of Bombay. During the mid-18th to 19th century, Bombay underwent significant change. A land reclamation project of the area between the seven islands, from the sea was completed in 1845. This, along with construction of major roads and railways, transformed Bombay into a major seaport. It currently has a population of about 22 million people and growing, about twice the number of Greater London and 5 times that of Los Angeles. Property prices are at a premium and the 55% of the city’s population who can’t afford them end up living in illegal slums. Mumbai is the wealthiest city in India and is the financial, commercial and entertainment capital. It is affectionately known as the City of Dreams. Mumbai evolved into a global financial hub, home to billionaires; ambitious workers flood in to the city every day to serve the global customers. For several decades, it has been the home of India’s main financial services, and a focus for both infrastructure development and private investment. From being an ancient fishing community and a colonial centre of trade, Mumbai has become South Asia’s largest city and home of the world’s most prolific film industry, Bollywood. In the middle of this wealth and poverty are India’s middle class – the office workers, teachers and professionals who raise their families in the suburbs but rely on the mega city of Mumbai for work. They are the commuters cramming themselves onto Mumbai’s crowded suburban trains, making more than 2.5 billion journeys per year. The trains are busy, hot and the city’s transport network is tested to its limits daily. Its most important transport hub, the historic Chhatrapati Shivaji Terminus (or Victoria Terminus as it was previously called after Queen Victoria), opened in 1887 when India was still part of the British Empire. The station was built at the southern tip of the city to service Mumbai’s busy port. Passengers arrived off the boat and were transported into the Indian interior by rail. Being at the centre of the rail network, connecting the whole of India to the rest of the world, turning Mumbai into the economic powerhouse it is today. These trains are the essential lifelines of Mumbai. Without them, the city, its economic centre, its millions of people – would all grind to halt. About 125 years ago, a Parsi banker wanted to have home cooked food in his office and hired someone to collect it from his home and bring it to him at work. He was the first ever Dabbawala or tiffin carrier. Many people liked the idea and the demand for Dabba delivery soared. In the beginning the deliveries were informal, with arrangements being made between workers and Dabbas. But one day an Indian entrepreneur Mahadeo Havaji Bachche saw the opportunity and started the lunch delivery service. He started with a team of 100 Dabbawalas. As the city grew, the demand for Dabba delivery grew too. The system has developed and from the original 100 Dabbawalas in 1890 there is today a Mumbai Army of 5,000 Dabbawalas fulfilling the hunger of almost 200,000 workers with home-cooked food brought from their home to their office and back each day and on time. The people who use the service tend to be middle-class citizens who, for reasons of economy, hygiene, caste and dietary restrictions or simply because they prefer whole-some food from their kitchen, rely on the dabbawala to deliver a home cooked mid-day meal. Most of them reach work by train, which means they leave home early and may be boarding chaotically packed carriages, making carrying their own tiffin a challenge. The Dabbawalla system provides a welcome solution by collecting meals prepared at home, then getting them to the office and back. Lunch is in a tin container consisting of a number of bowls, each containing a separate dish, held together in a frame, called a tiffin. The meals are prepared in the commuters homes as they travel into Mumbai each morning and delivered to them at work, in their own tiffin carriers. After lunch, the process is reversed. The origins of the word tiffin hark back to the days of the British Raj and represents a mid-day meal in place of afternoon tea. The word comes from the slang for “Tiffing” meaning to take a little drink. Tiffin often consists of rice, dal, curry, vegetables, chapatis or “spicy meats”. In addition, the lunch boxes are themselves called tiffin carriers, tiffin-boxes or just tiffins. Timeliness is crucial. Lunch must reach the client by 1pm every day and it can take up to three hours to deliver it to them. The whole city can be affected by late deliveries, so Dabbawalas are waved through by members of the public and traffic police alike. They are instantly recognisable, most sport a white kurta pyjama set, though this is not required but all wear the iconic Nehru cap and that makes them easy to spot in a crowd. The cap also protects their heads; Dabbawalas are expected to carry wooden tiffin baskets containing up to 45 metal lunch-boxes on their heads; the baskets can weigh up to 90kg. 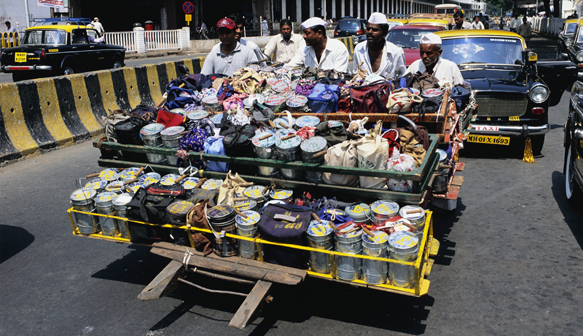 Each Dabbawala has a single collection and delivery area. At mid-morning, they tour their neighbourhood by bicycle collecting an average of 30 dabbas. Parking their bicycles outside a succession of middle-class tower blocks, they collect up to 200,000 home-cooked lunches. If, when the tiffin is not ready for collection Dabbawala reaches the home, this causes delays and could mean that the whole process is held up, something that is just not accepted. The Dabbawala will give the homeowner a couple of warnings and if the delays continue they will leave without their tiffins. Once collected the tiffins are transported by bike to the nearest local train station where the tiffin boxes are sorted into delivery areas using a specific labelling system, that the Dabawallas developed, on the top of the carriers. Once the train arrives, the tiffin boxes are sorted again before being loaded onto bikes or handcarts for delivery to their destination. A single tiffin could change hands between four and six times during its daily journey. At the destination station, they are unloaded by other dabbawalas and sorted, this time according to street address and floor. Then the crates of tiffin boxes, carried on the Dabbawalla’s heads, on hand-wagons and cycles, are delivered at 12:30 p.m. Some office buildings downtown, where the service is popular, keep one of their elevators free over lunchtime specifically dabbawallas and their precious lunchtime deliveries. The Dabbawalas take lunch together from their own tiffins at their respective hubs. Once the lunches have been eaten, the ritual is then played out in reverse, the same empty metal containers are escorted back to where they came from reaching home before the workers arrive back themselves from their day at work. The beauty of the entire system depends on teamwork, meticulous timing and an alphanumeric code scrawled on each metal lunchbox –designed to be easily understood by all Dabbawalas. In the early days of the delivery system the coding was a simple colour coding but since the expansion and growth of Mumbai the coding has also evolved into alpha numeric characters. Each tiffin carrier has, painted on its top symbols which identify where the carrier was picked up, the originating and destination stations and the address to which it is to be delivered. The home address, office address, railway stations of delivery and pick-up are all crunched into a small series of letters and numbers, painted by hand. Most of the Dabbawalas are illiterate or semi-literate with some having up to 8th grade education, yet the strong process, teamwork and understanding ensures that the deliveries work seamlessly. It is also entirely dependent upon the train network; the lifeline is the local train service of Mumbai. There is a train every four minutes and without them the dabbawalas could not run this service. It’s the smooth running of all the hub-and-spoke locations which ensures its delivery across the average 60–70 kilometres travelled by each tiffin. All of this sounds simple enough but when you consider, the timing, the organisation, the teamwork, the sheer numbers and the complexity of the city, their achievements are quite staggering. The army of approximately 5,000 tiffinwallahs make a mistake only about once every two months. In 2001, Forbes magazine rated the delivery system a 6 Sigma performance rating, a term used in quality assurance if the percentage of correctness is 99.9999999 or more in 2001. A 2010 study by the Harvard Business School also graded it “Six Sigma”, which means the Dabbawalas make fewer than 3.4 mistakes per million transactions. With deliveries to and from roughly 200,000 customers each day that translates to little more than 400 delayed or missing dabbas in a year. They charge Rs 800 per month (£10 or $12) and each of the 800 teams splits its share evenly between members, regardless of their seniority. That includes picking up a tiffin from home delivering it to the office and then returning the empty tiffin back home. The Dabbawallas work as a Co-Operative with supervisors called Mukadams, who are elected. They are members of the Mumbai Tiffin Box Supplier’s Association, which is headed by former Dabbawallas who are often found sitting cross-legged amongst workers as they take their lunch breaks at various hubs. The Dabbawallas are self-employed. To join the profession, you need to donate 30,000 rupees (£460) to the Dabawallas union. After that you are guaranteed a monthly income of 5,000 rupees but generally the take home pay is 12,000 rupees ($185 or £136) ­ a good salary by Indian standards – and a job for life. “The job lasts for as long as you are strong,” it is said. Amazingly, almost all of the Dabbawallas come from the same small village near Pune four hours away from Bombay. The Dabbawallas present a united workforce. High levels of trust are cultivated, with new hires being introduced by referral. The Dabbawallas are all non-meat eating Hindus who belong to the same caste, almost exclusively to the Vakari community, which worships the Hindu god Vithala. Vithala teaches that giving food is one of the greatest donations you can make. Their customers and the contents of their lunch boxes – reflect Bombay¹s rich ethnic mix: they are Hindu, Muslim, Sikh, Jain and Parsi. (The Parsis are Zoroastrians who settled in Bombay after fleeing religious persecution in Iran; they invented dhansaak, mutton or chicken cooked in rich dhal sauces). The association is in good financial health, they have an annual growth of between 6 and 10% year on year and an annual turnover surpassing 400 million rupees. They support the families of deceased workers and donating to various food distribution charities. It also supplements its income through the provision of cooked-meal services. Even in the face of potential disruptions of service such as riots, monsoon floods and the multitude of state and religious holidays which pepper the Indian calendar, although the 1974 railway strikes temporarily halted their service due to the interruption of a core part of their delivery model, the core ethos of a collective pursuit of excellence has served the dabbawallas well, they are united and proud of the service they provide the Mumbai people. A certain amount of the food in the tiffin boxes, is never eaten or barely touched, approximately 16 tons every day. The Happy Life Welfare Society, a local charity contacted the Dabbawala organisation, to see if they could help with an initiative to help feed Mumbai’s 200,000+ slum children. They immediately expressed their willingness to help. The solution they developed together is amazingly simple, inexpensive, and does not risk delaying the dabbawala’s schedule or their record of on-time delivery. And it gives the people of Mumbai a personal way to fight the poverty in their city, without demanding very much of them, it is called Share my Dabba. Once the worker has eaten his lunch, if he chooses to, he will place a “Share’ sticker on the top of the tiffin box. The Dabbawala will pick up the tiffins after lunch as usual, and take them back to a central redistribution location. Here volunteers meet them, quickly separate the tiffins with “Share” stickers, remove the food in them to give to the children, and then quickly repack the tiffins so the dabbawala can get them back to customers’ homes on schedule. The whole process takes less than 15 minutes. The food these children receive may be cold, but is otherwise perfectly good, and would otherwise be going to waste. It’s a brilliant, simple, creative way of addressing a gigantic problem. Everyone has a chance to personally contribute, and the cost – in rupees, or in disruption – is minimal. A simple but powerful video, now widely shared on Facebook, YouTube and others, tells the story. In the last few years, we have seen the rise of delivery services such as Deliveroo and Uber Eats with their bicycle riding workers bringing specially prepared shop bought food to your home or your desk using the latest technology to streamline their process. They are regularly in the news as they struggle with tackling inefficiencies, customer complaints and workers’ rights issues. For 125 years, the Mumbai Dabbawalas have collectively been doing this on time, every time. The newcomers have much to learn. Until Next Time – Have a great day! It's a wonderful world, let's explore it together.